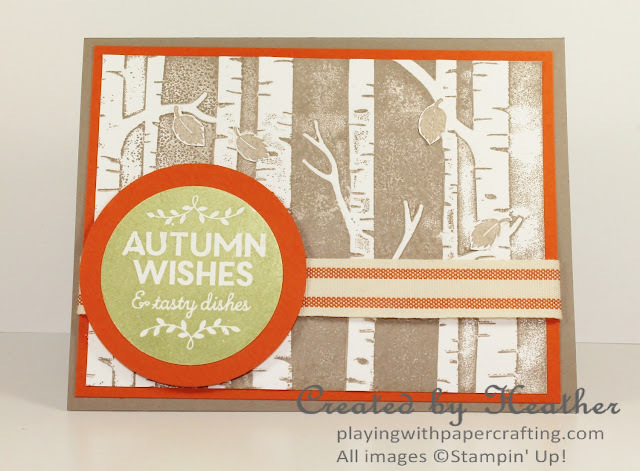 I wanted to use the Woodland Embossing Folder again with some ink inside to highlight the design, so I also got out the coordinating stamp set, Among the Branches, and what ensued was a kind of sepia designed background with a pop of colour for the sentiment. When I inked up the Woodland Textured Impressions Embossing Folder, I knew I wanted the trees white and the background Tip Top Taupe, so I added the ink to the debossed side of the folder. When I ran it through the Big Shot, it came out like this - uneven. I was going to toss it and try again, when I took a second look. The variation in shading gave it a vintage look, especially with the Tip Top Taupe looking like the old sepia photographs! I decided I liked the effect and I would run with it. My second experiment was stamping various leaves from Among the Branches in the challenge colours and fussy cutting them to add to the background. 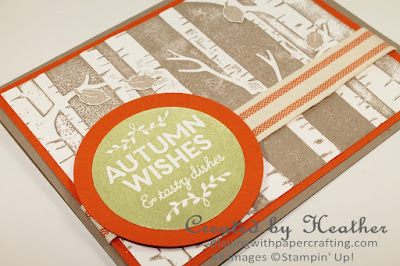 But they took away from the vintage look, so I decided to just add the Tip Top Taupe leaves to it. 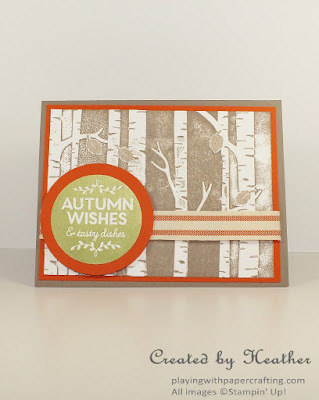 By the way, the Woodland Embossing Folder and the Among the Branches stamp set come in a bundle. If you buy both products together you save 15%. So I went with the sepia background and stamped the Autumn Wishes sentiment, from Among the Branches, in Pear Pizzazz, punched it out with the 2" Circle Punch and backed it with Tangelo Twist, punched out with the 2 1/2" Circle Punch. Ba-bam! Boy,does that pop! Now, I think this is the very first time I have used the 5/8" Striped Cotton Ribbon and though I didn't really warm up to it at first, it works really well on this card! So there you have it, for what it's worth! I am madly preparing for my Holiday Catalogue Launch tomorrow. I looks like I'll have a crowd! Games, good eats, prizes and new retired merchandise for sail! If you're in my area, drop by from 1 until 3 pm!